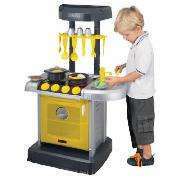 Childrens pack away toy kitchen. Found instore in bristol cribbs causeway tesco direct no longer avaliable online. Think they are having a major learout as lots of toys reduced by 75%. Still marked in my store as £30 but scanned at £7.50. Loads in stock. Checked my local Tesco again and took the toy to the checkout and it came up £7.50 even though it says £30 (the shelf says £15). Heat added. There are still quite a few in Reading (Kings Meadow) for £7.50. Fab find, my daughter loves it.